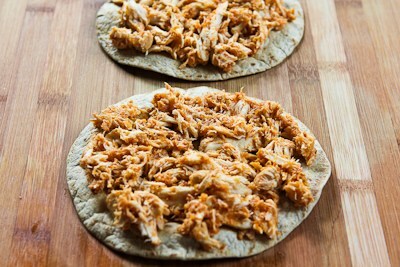 Spicy Shredded Chicken cooked in the slow cooker and then made into lettuce wrap tacos or tostadas! 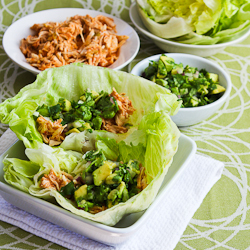 These Spicy Shredded Chicken Lettuce Wrap Tacos are one of those recipes that every slow cooker fan will appreciate because once you've made the spicy shredded chicken, there are endless ways to use it. 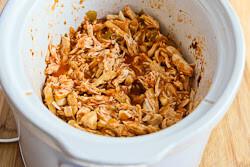 I experimented a few times with the slow cooker part of the recipe to get the chicken flavored just like I wanted it, and we made lettuce wrap tacos and tasty chicken tostadas, but you could also use this shredded chicken to make regular tacos, nachos, burritos, or even enchiladas. And don't skip the avocado salsa, which was the perfect thing to go with the spicy meat. 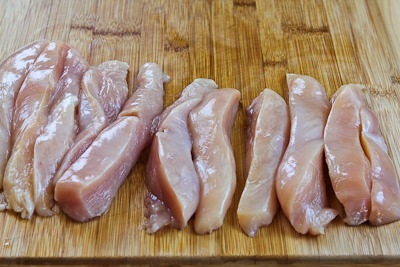 Trim four boneless-skinless chicken breasts, and then cut each one in half lengthwise. 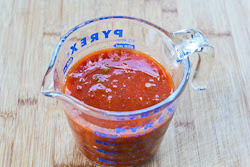 Mix together the salsa, onion powder, diced green chiles, Cholula hot sauce, and lime juice. 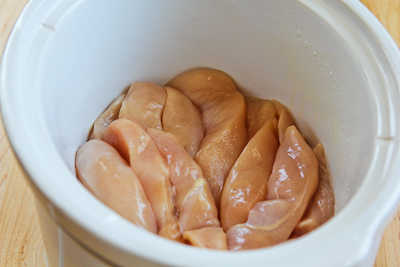 Pour the sauce mixture over the chicken in the slow cooker. 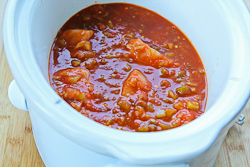 Then put the shredded chicken back into the slow cooker, stir to combine with the sauce, and let it heat up again while you prep your other ingredients. 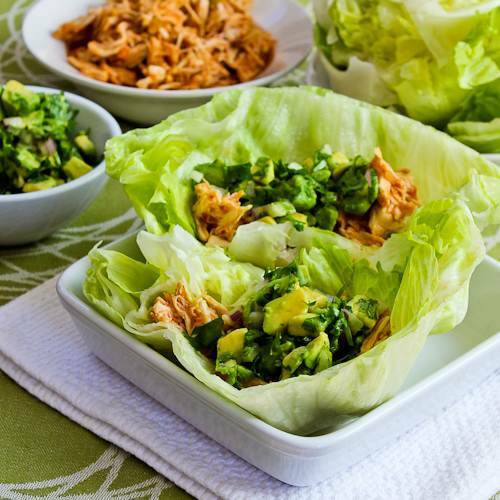 For these lettuce wraps, we liked Iceberg lettuce best. 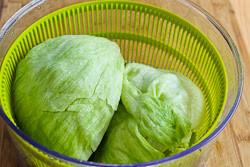 I cut a head of lettuce in half and wash it in the salad spinner before I break it apart for the lettuce wraps, but some lettuce may not need to be washed. 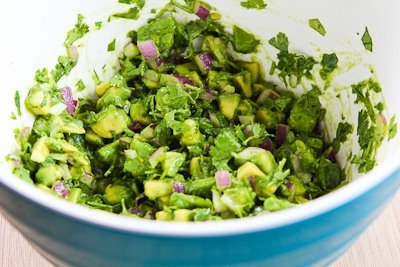 Combine the chopped avocado, chopped red onion, chopped cilantro, and lime juice to make the salsa. 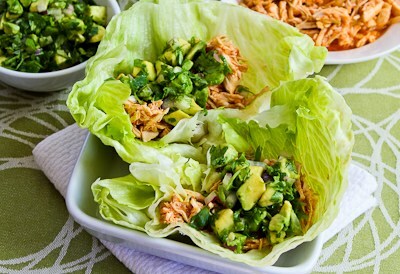 To make the lettuce wrap tacos, peel off two pieces of lettuce, fill with some shredded chicken, and put a generous scoop of avocado salsa on top. Fold over the lettuce and eat with your hands. 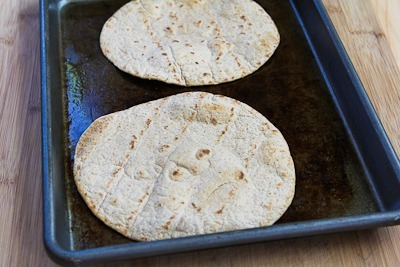 If you'd rather make tostadas, crisp flour tortillas in the toaster oven for 2-3 minutes, turning a few times. Spread some of the chicken over the top of the tortilla. Then spread a layer of salsa over that. We liked tomatoes on the tostadas, and you could use some on the tacos as well. 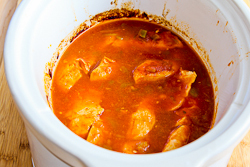 I used my Crock-Pot 3-1/2-Quart Slow Cooker to make the chicken in this recipe. You will need a slow cooker that's close to this size. For tacos, cut iceberg lettuce heads in half and wash in salad spinner if needed. 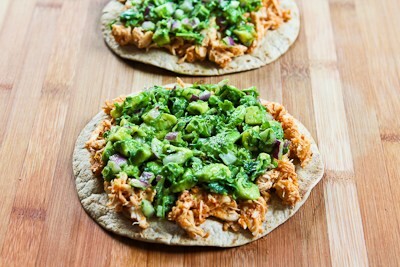 Peel off two pieces of lettuce and fill with a scoop of chicken mixture and a scoop of avocado salsa. Eat tacos with your hands. For tostadas, toast flour tortillas 2-3 minutes in an oven or toaster oven preheated to 400F/200C, turning them over a few times. Spread a layer of spicy shredded chicken on teach tortilla, followed by a layer of avocado salsa and chopped tomatoes if desired. Pick up and eat with your fingers or eat with a knife and fork. 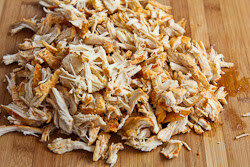 The spicy shredded chicken can also be used to make regular tacos, burritos, nachos, or enchiladas. OMG this looks sooooo good!! Can't wait to try it.